The Soviet Union fell down almost 28 years ago, but some of the memories from that era are still alive today. For the Russians not all of them are bleak, some are even very sweet – as sweet as a scoop of vanilla ice cream on a sunny day. In 1930’s the first recipe of ice cream was introduced in the Soviet Union and quickly became everyone’s favorite dessert. You should know that Russians love sweets and that preference has been around for decades. Due to the centralization of standards throughout everything produced within the Soviet Union domain, the ice cream, too, had to be made with certain specifications that emphasized on the nutrients first before the flavors. The ingredients must all be natural with no preservatives or artificial substances added. This was why the ice cream from the Soviet Union era was very special and – hands down – considered to be one of the best in the history of the world culinary. We are about to delve into the sweet nostalgia with 4 authentic ice creams of Soviet Union. We will see why they were more than just sweet frozen desserts but also something close to the people’s hearts that they carry and pass to the younger generations to keep the tender memory alive. Soviet ice creams, or мороженое (morozhenoye) in Russian, were richer than other kinds of ice cream around the world. This was because the fat content was higher than regular ice cream. The most legendary retro ice cream from the Soviet Union era was plombir. This ice cream is still highly desired today by the Russians and that’s why people keep trying to create plombir recipes that could come as close to the authentic one. It is unique because it is rich in fat and has barely liquid in it so the softness is unbeatable. The recipe calls for milk, cream, eggs, sugar, and condensed milk. You can imagine how heavenly it would taste on your tongue. When plombir was first produced in the Soviet Union and instantly became a hit, it was sold everywhere; by the roadside, in the park, restaurants, and shops. The peddlers would store the plombir in big metal containers then scooped it into a paper cup. The basic flavors were vanilla and chocolate with the first one as a favorite. In restaurants, plombir was served in a vintage metal bowl and could be topped with fruits, nuts, jams, or honey. Innovations in the convenient ways to consume the ice cream then step by step were made in the Soviet Union. Ice cream on a stick then came into the market and introduced as eskimo. A little different from plombir, eskimo appeared with something less fatty and richer in fruit juice; a popsicle. This new way of eating ice cream became a favorite during the summer and on the beachside although actually Russians loved an eskimo anytime of the year. After the stick, came the wafer cone. It was when sakharniy rojok appeared on the stage of Soviet Union ice cream. What new was obviously the cone, because the filling was basically still a scoop of plombir. But the plombir was also already tweaked to spice things up. The flavors started to vary and kiosks and peddlers added toppings on the scoop too. Everybody wanted a taste of rojok that the lines could get really long and one had to wait for quite a while before having a cone of sakharniy rojok. People enjoy them while having a walk in the park because of how neat the serving was, better than the eskimo that would get messy on the hand after a while. And then GUM, the biggest supermarket in Moscow – located on the Red Square – started to sell ice cream in packages with flavors that had never been offered before. The first crème brûlée plombir was sold there. It also launched lakomka; barrel-shaped ice cream covered in a thin chocolate shell. GUM then became an alternative to get ice cream from without having to stand in line. This breakthrough then led to more massive production of the frozen dessert in Soviet Union. Sadly, when the Soviet Union collapsed in 1991, the production of its authentic ice creams also took a fall. This opened opportunities for the market to produce and brand their own kind of Russian ice cream. In 2000’s, the country started to export and import thousands of packages of ice creams to and from around the world. The modern-day Russian ice cream is still really tasty and rich although not as good as the authentic one. The internet marketing even makes it possible for everyone around the world to buy and taste a package of plombir or lakomka. Well, of course they would taste different if you eat them in Russia, especially if you have time to visit and explore Saint Petersburg. There is an ice cream factory there, called Petrocholod that still makes ice cream with the old-day technology and, therefore, still preserves the authentic flavor of the Soviet Union frozen dessert. Just like a lot of things in the world, things from the goold old days or from the childhood always warm the heart. They make us want to return and experience them once again. 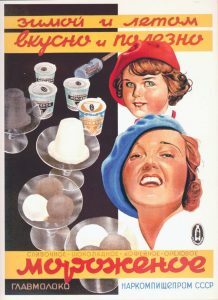 The same with Russians and their retro ice creams. They have such sweet nostalgia with 4 authentic ice creams of Soviet Union that we have just discussed above. The thing about nostalgia with culinary is actually more than just the taste on the tongue, but – deeper than that – the feelings that surround the culinary itself. The moments, the places, the comfort that runs through the mind when thinking about them. How about you? Do you have a fond memory and nostalgia with a particular food from the past?